I have been living in this maxi dress from The Flourish Market (use the code HEADTOTOECHIC for free shipping)! I really love the tie dye print, the hem, and how flowy this dress is. I was really surprised that it fit my 5’1″ frame, but I’m so glad that it did. I’ll definitely be wearing it over and over again this summer! It’s also perfect paired with this tassel statement necklace, and blush colored clutch for the weekend. Are you living in maxi dresses this summer? This maxi is perfect for Summer and love the tie dye. What a pretty dress Angela! It looks perfect for those hot and steamy summer days where NOTHING is comfortable! It so hard to find maxis that work for short people. I don’t want to go through the trouble of having one hemmed, but they are always so long. This one is cute and a perfect length! 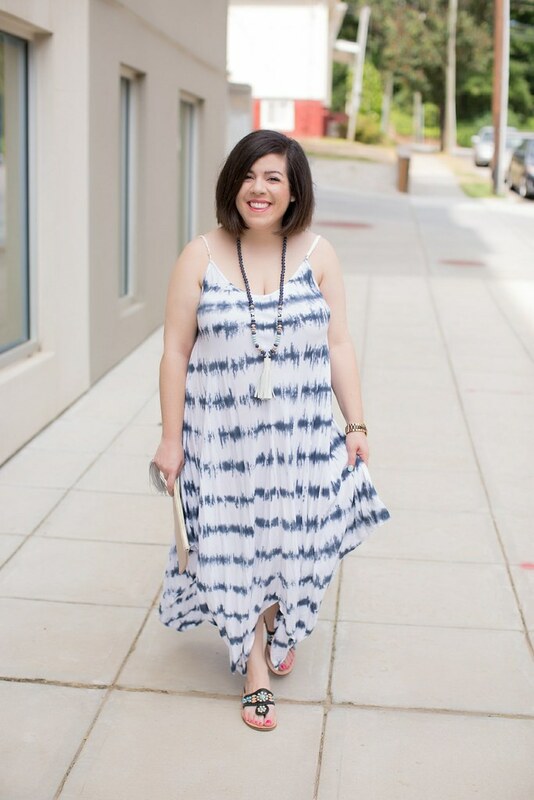 When a maxi dress doesn’t need heels or hemming it’s a huge win! Love the fun print too. I love this for summer AND the 4th of July!